Can The NASDAQ Composite Index Break Above Key Resistance? Despite a series of domestic political issues, the NASDAQ Composite Index (IXIC) has climbed steadily higher with buying momentum intact. As it now approaches key trend line resistance at the 3,970 level amid overbought conditions on long-term charts, the real question is whether the IXIC can break above resistance there and take aim at a test of the next resistance area currently sitting at 4,200 (but rises over time). The answer is: probably yes …for a number of reasons. To start with, Standard & Poor’s recently cut its estimate of annualized GDP growth to 2.0% from 3.0% citing the government shutdown likely shaved 0.6% or more off Q4 2013 annualized GDP. Bank of America Merrill Lynch also reduced their estimates of Q3 and Q4 annualized GDP growth to 1.7% and 2.0% from 2.5% and 2.5% respectively. These assessments suggest that the Fed will likely delay its QE taper plans of reducing its $85B monthly security purchases until perhaps next March or possibly to next June. The resulting effects should keep 10-year Treasury yields and long-term mortgage rates within a lower range than had been expected only a few months ago. In turn, that could reinvigorate the housing sector, trigger modest job growth and help stabilize the economies of many Emerging Market nations. Another plus was the most recent set of economic reports issued from China which reflected a rebound in their GDP last quarter and was clearly better than most economists had expected. That data set helped buoy commodity prices and spur a rebound in the markets of commodity based nations like Australia. Another thing to consider is that the swirl of opinions over the implementation of ObamaCare and the growing doubt that the desired effect of getting 7 million people to enroll by March will actually occur. Those doubts could keep a number of small business from hiring full-time workers and opt instead for part-timers for a while longer. Oddly, all of these near-term concerns could drive equity prices higher at the expense of bond and low yielding money market investments. Improved economic conditions in Europe could add the mix. Consequentially, a break above the 3,970 area on IXIC might well occur as long as economic conditions do not deteriorate unexpectedly any time soon. 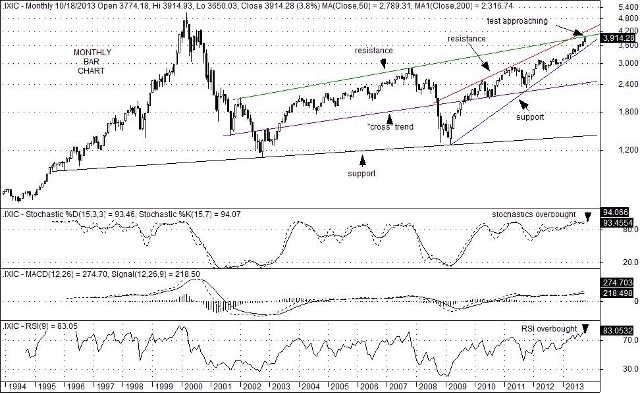 Is The NASDAQ Composite Index Due For A Correction? 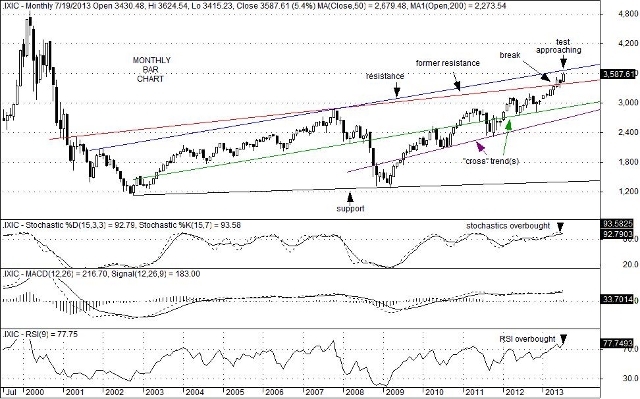 After a near test of long-term trend line resistance currently sitting at 3,660, two big cap tech stocks, Microsoft (MSFT) and Google (GOOG) posted disappointing Q2 earnings results last week causing the NASDAQ composite Index (IXIC) to dip by 0.66% on Friday. Although MSFT and GOOG fell by 11.40% and 1.55% respectively, with a number of other names including Apple (AAPL), Mattel (MAT), eBay (EBAY), NVIDIA (NVDA), Yahoo! (YHOO) and Intuit (INTU) posting losses of between 1.22% and 2.82% and with Intuitive Surgical (IRSG) plunging by an outsized 6.83%, the overall index did only fall by only 0.66%. That is because a number of healthcare, retail and data storage devise maker stocks posted healthy daily gains. Still, with overbought conditions currently present on the NASDAQ Composite Indexes’ long-term chart, and with long-term trend line resistance sitting at the 3,660 level at the moment, further upside gains appear to be limited over the short run. Nevertheless, U.S. economic conditions continue to show slow, but steady improvement despite higher gasoline prices, continued European woes, concerns over the economic health of China and growing municipal calamities highlighted by the city of Detroit. Back-to-school shopping, the “wealth effect” of both higher real estate and equity prices, and an improving jobs market could team up to keep consumer optimism positive for months to come. Moreover, as long as Fed Chairman Bernanke and the FOMC believe that the unemployment rate is too high and the “risk” of an inflation surge is low, monetary policy will remain highly accommodative. This suggests that equity market corrections will likely remain limited as well. As a result, a test of former trend line resistance (now support) at the 3,309 level on the NASDAQ Composite Index could become a buying opportunity, if it were to unfold. A solid break below that support area, on the other hand, would imply that a broader correction could be in the works instead. You are currently browsing the archives for the NASDAQ Composite Index (IXIC) category.